Non-point sources- less obvious than Point Sources, but they are responsible for a whopping 96% of water quality impairments throughout Pennsylvania! According to PA DEP, the overwhelming majority of impaired watersheds are polluted by nonpoint sources, including acid mine drainage, atmospheric deposition, improperly operating on-lot sewage systems (septic systems), earth moving, stream hydro-modification, improper timber harvesting, and more. Many drinking water contamination problems arise from people’s everyday activities. 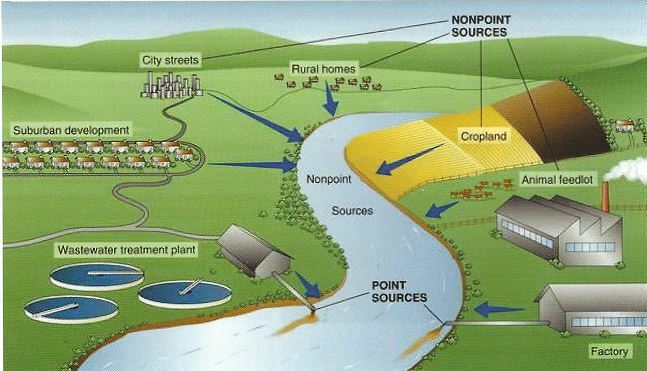 Contaminants can be introduced into ground water, rivers, lakes, and streams from a variety of sources: septic tanks and cesspools; surface impoundments; agricultural activities; landfills; lawn care and gardening; underground storage tanks; abandoned wells; accidents; storm water systems; illegal dumping; and highway de-icing are examples.